In John 13, we find one of the oddest interactions between Jesus and His disciples. Of all the strange conversations, interactions, and reactions that we see in the gospels; this one may be the oddest. Jesus gets up from the dinner table, and washes the feet of his disciples. This is strange for a multitude of reasons. First, it is strange for cultural reasons. Washing feet was considered a humiliating task in Jesus’ day. So humiliating that a Hebrew slave could not be required to wash guests feet. It may not have been customary for someone to wash guest's feet, but it was customary for arrangements to be made for guest to have clean feet. But this job would have fallen to the low man, not the leader of the house. Jesus was the undisputed leader of the group. They referred to him as Rabbi and Master. It would have been shameful to see Jesus begin to wash their feet. Next, it is strange for practical reasons. It was not necessary for Jesus to wash their feet. He could have just as easily told them that they need to get up and wash their feet. When you come to the dinner table with dirty hands, Momma doesn't bring soap and water over and wash your hands for you. She demands that you show some respect and go wash your hands. It is strange because he goes out of his way to wash their feet. In a lasting and powerful demonstration, Jesus sets an unusual precedent. Where am I doing what nobody else wants to do? Where am I serving in ways that require me to humble myself? Who am I serving that society says should be serving me? When am I willing to do what is not necessary in order to serve others? Jesus’ actions and command requires us to humble ourselves and serve others. If we truly want to be his followers: then we must do so even when we don't want to, even when we don't think we should have to, and even when it is something that we don't want to do. Following Jesus is hard. One thing that I have learned as we have walked through different people in the lineage of Jesus is that the Bible make no effort to hide it's scars. There are people in the Bible who do not necessarily have to be there. Scripture could just as easily have glossed over them with a passing mention. In fact, Scripture does that with so many people. The book of Numbers is nothing but a long list of people who get a quick mention but nothing else. Something like: “Bill lived and had these kids,” and that is all we know. At some point in time a guy named Bill was alive and had kids. But there are people that have their whole story told in Scripture; or at least a part of their story that makes it feel like it is the whole story. People who I feel pretty confident would have rather been glossed over with just a passing mention. People who have an embarrassing story. A story they are probably ashamed to remember, much less record it for the rest of time. This has brought two questions to my mind. 1.) Why does Scripture make sure to include the broken, bruised and shameful stories? 2.) If Scripture makes no effort to hide its scars, then why do we as the church put so much effort into convincing people that we are perfect? Answering question one makes me think of Christmas with my family. All the moms and cousins would gather around and put together puzzles. Not small puzzles, but large complicated puzzles of Thomas Kinkade paintings. I was never allowed to help because I wasn't skilled enough to work the puzzle, even though I had many small puzzles that I had memorized. The more pieces the puzzle is broken into, the more it reveals the skill of the one putting it back together. God's greatest works of redemption are not those with perfect comfortable lives. His greatest master pieces display His ability to take something totally broken and put it back together. Answering question two makes us acknowledge the truth in question one. We know we are broken, but we don't want others to know it too. We must reach the place in our walk with Christ that our confidence lies in our Savior's ability to put us back together. Only then can we be honest with one another about: 1.) how broken we really are, and 2.) how great God really is. Our brokenness reveals the greatness of His redemptive work. 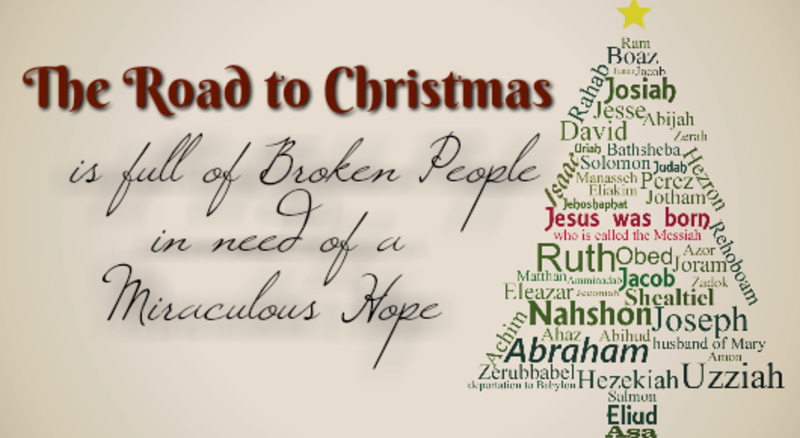 As we wind our way down the broken road toward Christmas, one thing should be noted: God never uses perfect people. That is good news, because none of us are perfect people. What we need is the hope on one who is, and that is exactly what Christmas represents. Today we look at Ruth's story. Ruth had some major issues. But, for some reason God chose to include Ruth in his line to the Messiah. Maybe you can identify with some of her struggles. Ruth was a widow. This in itself is not what made Ruth imperfect, but it does clue us in on some of her struggles. Ruth knew the pain of losing her husband. Ruth understood the fear that it brings. Ruth was a widow in a day and time when being a widow left women exposed and vulnerable. Ruth understood heartache. Ruth was an outsider. She was a Moabite in a country that despised Moabites. The phrase: “We don't want your kind around here” was something that she more than likely heard at some point in her life. Ruth was the wrong kind of person. Ruth was helpless. We find her picking up the left over grain in the fields. This was not a path to prosperity. It was a life of desperation. A life of questioning what will happen to me next. Ruth lived a life of uncertainty. Maybe you know the pain of heartache. Maybe you feel like you are the wrong kind of person. Maybe you are living in a season of doubt and uncertainty. There is hope. For all that would make Ruth an unlikely great, great…grandmother of Jesus; Ruth was a woman of certain hope. At the lowest point, Ruth turned her hope to Jesus. With her statement to Naomi of “your God will be my God,” Ruth put her trust and hope in the living power of the God of Israel. Ruth placed her hope in a coming Messiah, and God brought her into the family of His Son. Ruth finds the same hope in Christmas that you and I can find today. Just as God brought her into the family that would birth His Son; God adopts us as sons and daughters through the death & resurrection of His Son. All we must do is follow Ruth's example and place our trust and hope in that same Messiah.